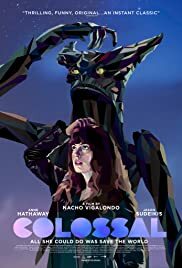 Just got out from seeing Colossal, a fine indy film written and directed by Nacho Vigalondo. The premise is this: a young woman loses her job and boyfriend in NYC and, unable to find work and broke as well, moves back to her home town to stay in her parent's empty house. At the same time, a giant monster begins to destroy Seoul , Korea . The woman realizes after a while that she has a mysterious but very direct connection with the monster destroying a city a half a planet away. Science fiction, romantic comedy and psychological thriller in a well executed fusion of what would conflicting genres, writer and director Galondo does not merely mash together disparate kinds of pop culture, but instead weaves them together. Without going into tidbits that would spoil the film, I would just add that the script is as tightly constructed as it is wildly imagined and it requires to suspend our disbelief a little further and, in a more challenging aspect, to suspend it in ways not usually demanded of us as viewers. Think of this: if one's actual life seems to slip, merge, evolve and abruptly change tones, perceptually, from being a comedy, tragedy , romance and soap opera in the course of month, a week, a day, why wouldn't this also hold for a fictional , more fantastical world? Colossal does , I promise, contain all the elements I've mentioned, and they are pertinent to the story being told, but this a narrative with the varied genre restrictions removed. For all that seems fantastic and scary, the players and their situations and how they respond to the changes that happen to them are, (ahem) human, all too human. Odd, quirky and defying genre expectations, this is splendid and engrossing story, with a perfect ending to seemingly unresolvable complications that you didn't see coming. Fine performances by Anne Hathaway and Jason Sudeikis.